A proven method to address opioid dependence still faces resistance due to stigma, financial access, and misunderstanding. As the opioid epidemic rages on, the use of medication in addiction treatment remains a debated topic. With prescription opioid drug overdoses having increased threefold in just three years, the treatment community is vying for solutions and medication-assisted treatment (MAT) is a critical element. MAT is an evidence-based approach that combines behavioral therapy and medications to treat substance use disorders (SUDs). It is currently considered the gold standard for addiction treatment for opioids. With MAT, the primary medications being used are buprenorphine and methadone. In more recent years, extended-release naltrexone has also been approved for the treatment of opioid dependence. According to the National Council for Behavioral Health, naloxone has also become an increasingly important component of local efforts to combat opioid overdose and death. Christina M. Andrews, PhD, an assistant professor at the College of Social Work at the University of South Carolina, says that the research indicates there are between 2.5 and 3 million people with an active opioid use disorder. But based on research, not nearly enough are receiving medication in their recovery. "This is concerning considering the fact that we have 20 years of evidence documenting that medication is more effective at moving people to recovery and keeping them in recovery than any other method," Andrews says. "It raises some very serious issues." The implementation of MAT sounds relatively cut and dried. But it's not. MAT is widely misunderstood and remains controversial in many circles. This is largely because of the strong bias and discrimination around SUDs, says Nick Szubiak, MSW, LCSW, assistant vice president of addiction and recovery for the National Council for Behavioral Health. He says there has long been a stigma associated with MAT. Ellen Kreida, LICSW, MPH, a clinical social worker at the CATALYST Clinic at Boston Medical Center, agrees and says this can pose a big challenge for patients. She has worked with patients who have been told they've just "replaced one addiction with another" when using medication for treatment purposes. "The stigma associated with it can make patients feel that they're unable to speak up about their recovery," Kreida says. "Though medication may have really helped them, they might feel that they can't say anything about it. They may feel very conflicted about it, as being honest is a big part of the recovery process. However, they might feel that if they're honest, they'll be told they're not truly recovered." It's a real catch-22, and providers don't necessarily always help. Szubiak says that social workers, medical personnel, and other providers in the field have not had adequate training around addiction, making lack of education a key part of the problem. "What makes MAT so controversial is the judgment surrounding the use of medications—maybe even an opioid—to treat someone who has an opioid problem," Szubiak explains. "To some, it sounds a lot like we're saying to treat alcohol addiction with vodka instead of gin. It doesn't make sense until you take a step back and look at the neurobiology of addiction and what's actually going on in the brain." While there is an inclination to look at addiction as a "moral failing" or a "personality problem or defect," Szubiak says that these belief systems have a major flaw in that they ignore the changes that are going on in the brain. "Brain changes have occurred over a long period of time and the person doesn't even realize that they're losing voluntary control. In some ways it is like telling a person who has diabetes that exercise and willpower will be enough to help their pancreas to begin producing insulin. While the individual [with an SUD] made an initial choice—admittedly unlike the person who has diabetes—over time it becomes a situation where they have lost control," Szubiak says. But herein lies another controversy. While the field understands addiction to be a chronic disease that changes the structure of the brain and how it works, critics, including renowned addiction psychiatrist Sally Satel, MD, believe that calling addiction a brain disease may make it more difficult to treat. "If we put too much emphasis on the neural mechanisms of addiction, we don't do justice to the psychological, behavioral, social, and cultural aspects of addiction," Satel says. "These other domains have enormous causal power and the changes people make in their worldview, their environment, their relationships, and their sense of purpose are all essential to recovery." Linda Rosenberg, president and CEO of National Council for Behavioral Health, says it is important that we continue to have these discussions in the process of developing strategies to combat the opioid epidemic. While MAT is the gold standard for opioid dependence treatment, Rosenberg points out that too few people have access to it. Part of that remains a perception problem. People struggling with addiction have been a population long avoided by medical professionals—and even social workers, Rosenberg says. That hard truth complicates access even more. If there aren't enough providers willing to work in addiction treatment, access will remain limited. "Treating someone with an addiction is difficult and many people avoid it," she admits. "You're talking about taking on a situation that can be chronic and affects more than just a person's health. It affects their livelihood, it disrupts their family life, and it often has ties to the criminal justice system. Even as social workers, it's a population I believe has been avoided. I have not met a lot of people who say they're going into the field of social work because they were interested in the field of addiction. It's complicated." Further complicating this patient population is the fact that many of them also present with a comorbidity such as PTSD or depression. "We know that people with a severe addiction disorder who also have a comorbid mental illness do not make progress in a straight line," Rosenberg says. "We may know that fact—but it can still be very tough for providers." This remains another key barrier. "We need to start treating addiction like we do other chronic health conditions," Szubiak says. "If a patient presents with another chronic health condition and does not respond well to the first attempt at treatment, we don't pull it away from them and say they aren't doing well so they can no longer be treated. Instead, we provide more. But when it comes to addiction treatment, the inclination [of some] when the person returns to use is to kick them out of the program and to tell them when they're ready to come back." Szubiak says this is an antiquated approach to addiction. "We must begin to treat addiction across the continuum of care, just as we would any other neurobiological brain disease," he adds. "We must treat it like the chronic health condition that it is." Reconciling differences between other recovery approaches also complicates the situation. Szubiak points out that the 12-Step approach to recovery is based on an abstinence-only model. He says that this community is grappling with the dilemma over how medication is now fitting into the equation. "Many people who have saved their own lives or been saved by 12-Step support groups might feel that MAT is a threat to principles of their recovery," Szubiak says. "I think it's important that we, as practitioners, remain respectful of the 12-Step community or other support groups that are abstinence only. After all, any way that works for someone to find the path to recovery is important." Even so, people who are successfully utilizing MAT to find their way to recovery still need community and access to recovery housing, Szubiak adds. When the focus is on abstinence only, you are ruling out a critical part of the recovery population. Part of the stigma of MAT involves patients being told they are not "fully recovered" if they've used medication. "If patients hear these viewpoints, it's something that they can come to internalize," Kreida adds. "The stigmas that surround MAT are still there. If someone is holding off from using it because of the stigma, that's incredibly unfortunate because we see this as life-saving treatment." Besides long-held beliefs and population avoidance, financial access also remains a concrete problem that stands in the way of more widespread use of MAT. Andrews says that private insurance coverage for MAT has typically been more generous than coverage under Medicaid. Some types of insurance may include certain drugs and exclude others. For instance, Andrews says, in South Carolina, Medicaid does not cover methadone. Considering different medications may work better for one individual over another, Andrews stresses that it's important providers have some flexibility to choose the best course—instead of being pigeonholed into a choice simply because it was the only medication covered. While the need for medications to treat SUDs has grown, Andrews says that the number of providers actually offering the option isn't anywhere near where it ought to be. "Our research based upon data collected in 2017 shows low rates of MAT implementation," Andrews says. "Overall, we're seeing that only 20% to 40% of providers are offering MAT. It's lower than we'd like to see. It is my opinion that every provider who is serving individuals with opioid use disorder should make these treatment options available." Required training involved in the administering of the drugs used for MAT may also be a barrier. For instance, buprenorphine requires an eight-hour medical course. Andrews adds that beyond required training, providers may be wary about bringing a drug such as buprenorphine into their clinic due to the "time burden" of learning to overcome new challenges or remain on top of evolving information about the drug. "Unfortunately, the stigma that follows buprenorphine is also a barrier to bringing this drug into the treatment setting," Andrews adds. "There is a worry that it will attract 'those types of clients' into their setting." Szubiak agrees. He says the language around saying "those addicts" or "those people" is a legitimate problem in the world of addiction recovery. "We must find a way to move on from the old mythology and beliefs surrounding addiction—and we're not there yet," Szubiak says. "We're making strides, but we should not be ready to take our foot off the pedal just yet. There's a long way to go. We're talking about a culture shift and there's no one way—or easy way—to do that. The culture surrounding addiction must change if we want to continue to make progress." Szubiak says the same is true of the "provider perspective" and even the perspective of the recovery community. As these perspectives begin to shift, only then can real change be made. An important role for social workers is to begin to explore and advocate for the inclusion of MAT within the programs they work in. "MAT should not be limited to the treatment setting alone," Andrews says. "It can be provided in mental health clinics, acute care settings, primary care settings, and more. As long as you have someone who is able to prescribe and has completed the proper training, then you can begin to implement MAT into your program. It makes perfect sense for social workers to become more involved in programs that include MAT as the client can concurrently move right from MAT into the psychosocial services that are also needed." Research by Bride, Abraham, Kintzle, & Roman (2013) indicates that social workers are more accepting of MAT than other providers, making them an important piece of the puzzle. Szubiak says that involvement with MAT needs to be part of the skill set that comes with a social worker's toolbox. "We don't necessarily need addiction specialists to be the only ones leading this crusade," Szubiak continues. "Social workers have the skill set to treat addiction. We just need to keep educating ourselves. We are already good at behavior modification—now we just need to look more closely at how MAT fits in. We are already geared toward the movement of working with an integrative environment, and that's what's needed to help support people with substance use disorders. Social workers are a great fit for working with this community." There is also room for change in education, Rosenberg says. If we truly want to change the dialogue and the culture surrounding addiction, then social work education must also adapt. In many schools across the country, it has. "I would say that any social worker who is on faculty at a school could make a huge difference in the world of addiction—and specifically in the acceptance of MAT—by looking at their curriculum and making sure this is part of it. Social work schools can also make a difference by looking at their placements. We need to be placing social work students in addiction treatment programs where they can truly learn the ropes. I believe that if we are practicing working in this area that we can truly start to make a difference." Even the name of the treatment might itself require updating. Kreida says there has been a push toward rethinking the connotation of what the particular phraseology invokes. "We like the idea of saying 'medication for addiction treatment' because of the stigmas that might be attached to the word 'assisted,'" she explains. "Even if we can't change the terminology, as providers, we have to be more cognizant of how we talk about this treatment." While there is still a long road ahead, it's always helpful to look back and see how far we've come. Rosenberg says that great strides have been made when it comes to acceptance of MAT. "Just four years ago there was by no means a wide acceptance of MAT," she says. "That has changed. The research is coming quickly, and the long-held beliefs are changing. We're seeing more mental health clinics adding MAT to their program. But there is certainly room for more. The good news is that people are listening—they are actively seeking solutions—and that can only help push things forward." Bride, B. E., Abraham, A. J., Kintzle, S., & Roman, P. M. (2013). 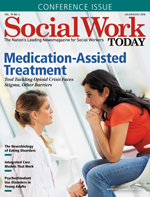 Social workers' knowledge and perceptions of effectiveness and acceptability of medication assisted treatment of substance use disorders. Social Work in Health Care, 52(1), 43-58.